Disc replacement surgery evolved as a result of the problems associated with fusion surgery in the cervical spine. 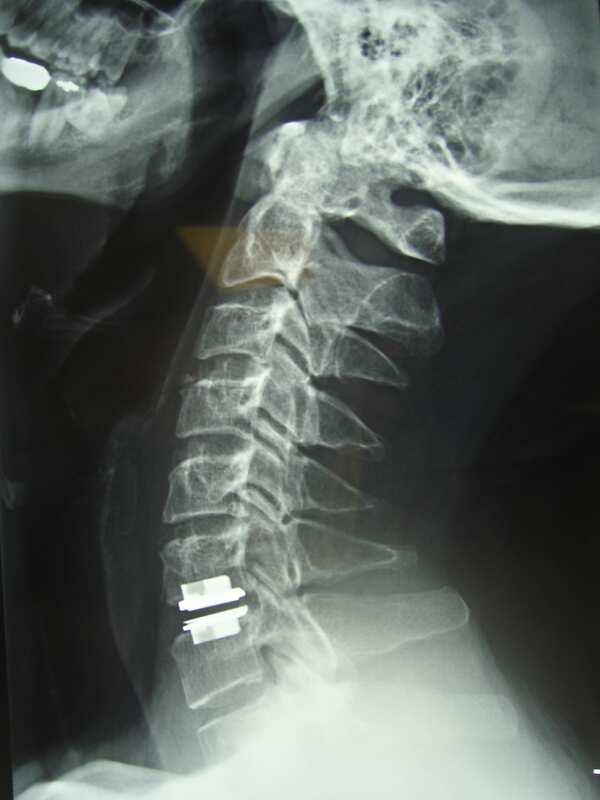 This is the same operation as an anterior cervical discectomy and fusion, but a mobile artificial disc is placed in the space instead of the bone. We believe artificial discs protect the adjacent disc levels from developing adjacent segment degeneration. There are currently different brands of artificial discs on the market – Prodisc C, Servicor, Prestige and PCN. Because of the alteration to spine biomechanics that occurs after a fusion operation, many patients who undergo spine fusion surgery will develop problems at the next level in the spine called “adjacent segment degeneration”; this may require further surgery. Up to 20% of patients may require surgery within 10 years of their initial operation. Disc replacement surgery evolved as a result of the problems associated with fusion surgery in the cervical spine. Because of the alteration to spine biomechanics that occurs after a fusion operation, many patients who undergo spine fusion surgery will develop problems at the next level in the spine called “adjacent segment degeneration”. This may require further surgery; up to 20% of patients may require surgery within 10 years of their operation. Motion preservation surgery aims to minimise the risk of developing further symptoms at adjacent levels following fusion surgery and reduce the need for further surgery. Young patients have highly flexible spines compared with older people. In suitable cases patients who require removal of their discs to decompress the spinal cord and nerves can have an artificial disc inserted rather than perform a spinal fusion. This can help minimise the risk of developing problems at the adjacent levels following a fusion procedure. Dr Steel reported his initial experience with cervical and lumbar spine disc replacement surgery at St Vincent’s Hospital in 2007. Dr Steel has one of the largest personal series of patients undergoing disc replacement surgery in Australia. He presented his results at the Neurosurgery Society of Australasia meeting in September 2008. In August 2009 Dr Steel was the first surgeon in Australia to insert the new CerviCore intervertebral disc prosthesis.